Royal Canadian Legion Branch # 3 Chatham was advised some of their submissions for the Provincial Literary Contest were very successful. Presentations were recently awarded to Noah Blakely on receiving 1st place in the Remembrance Day Literary Contest Provincial Finalists -Junior Poem Category. His work will be forwarded to Dominion Command for the National Contest. Alexandre Comeau received an award as he earned 2nd place in the Remembrance Day Literary Contest -Provincial Finalists – Intermediate Essay Category. The presentation was done by Branch 3 Chatham Legion Poppy Campaign Chair Gerald Mullin and Royal Canadian Legion District Commander for Northumberland-Kent Stella Ward. Royal Canadian Legion Branch 3 Chatham President Ted Quann congratulated the students on their success. 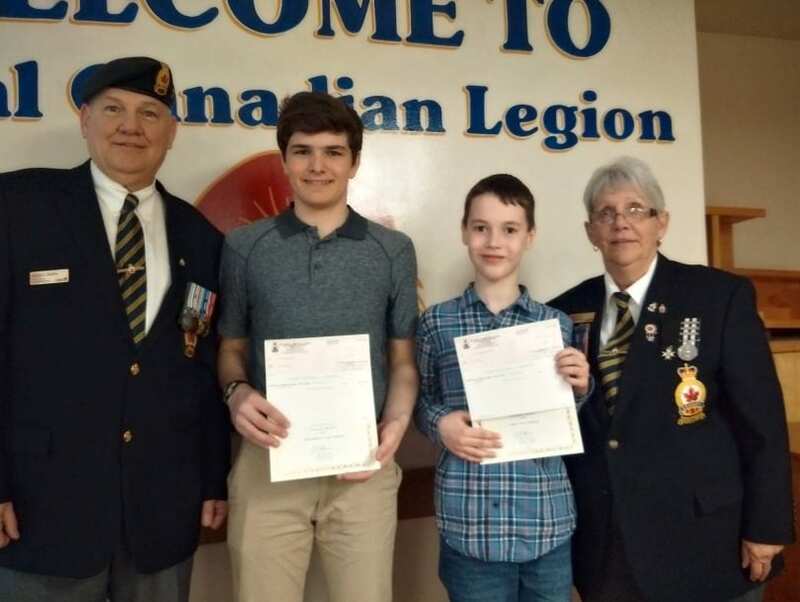 Royal Canadian Legion Branch # 3 Chatham Poppy Campaign Chair Gerald Mullins, Alexandre Comeau, Noah Blakely and Royal Canadian Legion District Commander Northumberland-Kent Stella Ward.